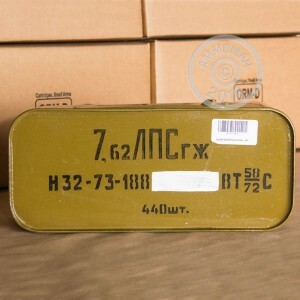 These Sealed Russian Surplus Spam Cans are an incredible value for anyone shooting 7.62x54r ammo! These 440 round cans were sealed against air and moisture during the manufacturing process. Each steel core round is sealed at both ends to further prevent moisture damage. 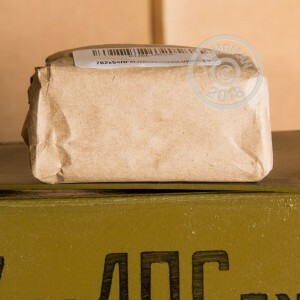 These rounds are considered magnetic and corrosive. Spam can openers not included. Sealed tin was in great shape. Opener was supplied. Fast shipping. I was amazed at how well this stuff shoots. Its steel core so some ranges don't allow it. Excellent. Been buying ammo on occassion from AmmMan for some time. Always satisfied with the service and ammo. Came two days after ordering. Great service, a spam can opener was included even though the add said no opener was included. That's a $ 12.00 extra item as listed on GB. Ammo arived in good time. Arived in good shape. Have not shot it yet but it looks very nice. I am very happy. Arrived quick and hard to beat the price! I had a bonus of actually opening the box and finding a can opener! I can't say enough good things about this ammo..works every time over 1000 rounds later no failures..
Bought the ammo yesterday and it arrived today. Shot about 20 rounds or so and I haven't had a problem with it. I love shooting this kind of ammo. The spam can it came in was a bit hard to open, I actually cut myself on some of it. All around great job guys, I'll definitely be doing business with you again! I'll update if something comes up. 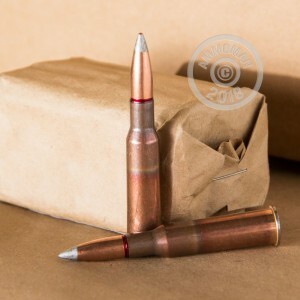 I went on line one weekend and ordered 45 spam cans of this ammo on two different orders and to my surprise the orders shipped the next business day--great doing business with a seller that understands customer satisfaction. I have not shot any of this ammo but the purchase process was great. Got the spam can 2 days after ordering! Awesome service and great value on this spam can! No can opener, but I wasn't expecting one. :) I'm keeping this one sealed for awhile anyway. The can itself is in amazing shape for being 42 years old. I have shot over 1000 rounds of this ammo and never had a failure to fire. It is corrosive and dirty ammo but hey if your going to have the fun you have to put in a little work and clean the gun!